Liverpool’s 3-1 win over Burnley on Wednesday night was tempered by the sight of defender Joe Gomez being stretchered off injured in the first half. Jurgen Klopp‘s decision to rotate much of his team for the midweek clash meant that Gomez moved from his usual centre-back role across to the right side of defence. He was involved as an outlet early on for the Reds, but one foray forward ended in the impressive youngster being on the end of a heavy challenge from Ben Mee. The tackle saw Gomez sliding over the turf after getting his left leg caught beneath his opponent, and he remained down off the pitch. After several minutes of treatment, Gomez was eventually stretchered off, with Trent Alexander-Arnold taking his place. And after the match, Klopp confirmed in his press conference that the problem could be a serious one—and that he had previously asked the ref to clamp down on some hefty challenges from the Burnley players. “Joe is injured and probably not only a little bit. We have to see tomorrow. It’s [his] ankle, yes,” the boss told reporters. 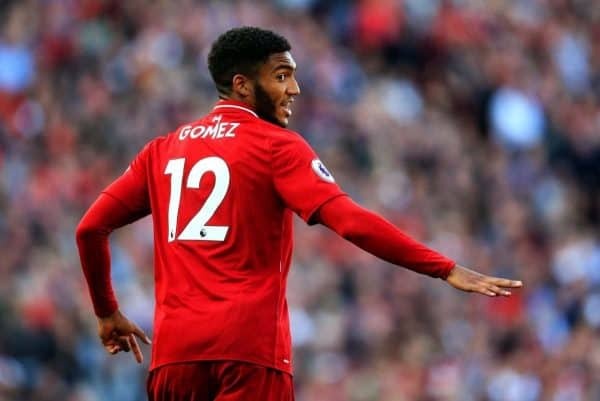 With Gomez having put in a string of imperious performances this season, it will be a massive blow to be without him with some huge games coming up. After a trip to Bournemouth on Saturday comes the all-important Champions League game against Napoli, for which Gomez must be considered extremely doubtful. That is followed by the Anfield clash against Man United five days later, with another three league games in eight days to come before the end of the calendar year. Klopp must find a reliable presence to partner the again-impressive Virgil van Dijk, who was both a colossus at the back and a vital provider of the Reds’ second goal of the night in attack. Joel Matip filled in at centre-back against Burnley, while Dejan Lovren has been missing again recently and is enduring a stop-start season.